Two big things just happened related to the Health Insurance Marketplace. I’ll give you the good news first. The Health Insurance Marketplace at HealthCare.gov opened up for window shopping – you can see the plans and prices that will be available to you for 2015 coverage. This gives you several extra days to identify your needs and find plans that fit your budget. You can also find out if you’re eligible for financial help to pay for insurance, which can lower your costs considerably. Open enrollment starts this Saturday, November 15, and signing up by December 15 means your insurance will kick in on January 1, 2015. You can find the timeline for enrollment here. Friday afternoon the U.S. Supreme Court granted a hearing for King v. Burwell, a lawsuit attempting to eliminate financial assistance to low- and middle-income enrollees who purchase insurance in the federal Marketplace (HealthCare.gov). As we’ve discussed previously, this financial assistance is essential for connecting Texans to insurance that fits their budgets. 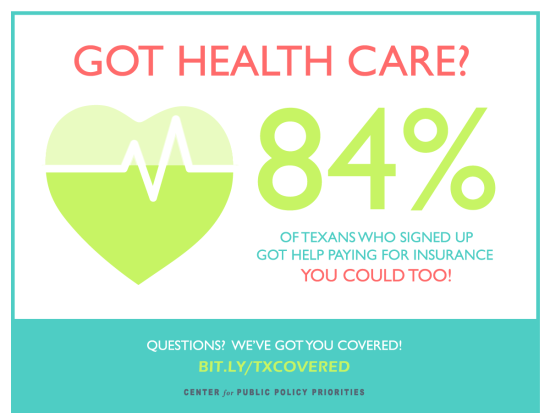 Subsidies helped 84% of all Texas Marketplace enrollees – over 616,000 people – sign up for coverage during 2014. And financial assistance will help more Texans enroll in coverage for 2015. Open enrollment – which starts this Saturday – will not be affected in any way by the U.S. Supreme Court announcement. People who provide application assistance to help consumers enroll should feel confident that consumers’ access to financial help is safe during the current enrollment period. If the Court ultimately decides to limit financial help to millions of Americans and hundreds of thousands of Texas, consumers will not be required to pay back those tax credits. Hundreds of thousands of Texans are getting Marketplace renewal notices right now. Our next blog post will let you know what you need to do to renew your coverage. Stay tuned.